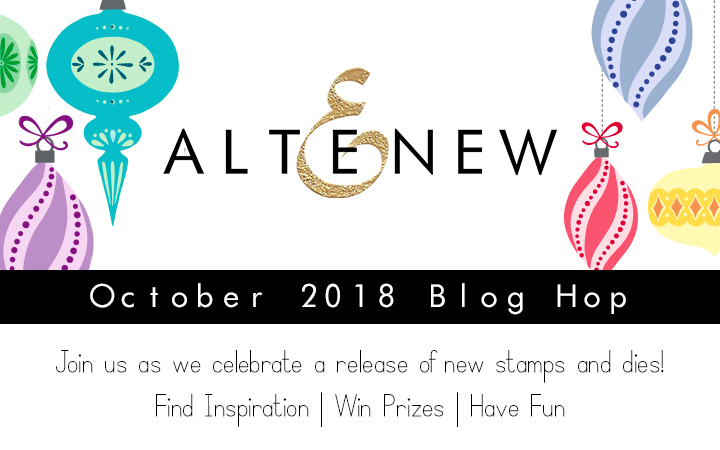 Hello everyone and Welcome to the Altenew October 2018 Stamp/Die Release Blog Hop! I'm so excited to join this hop!!! 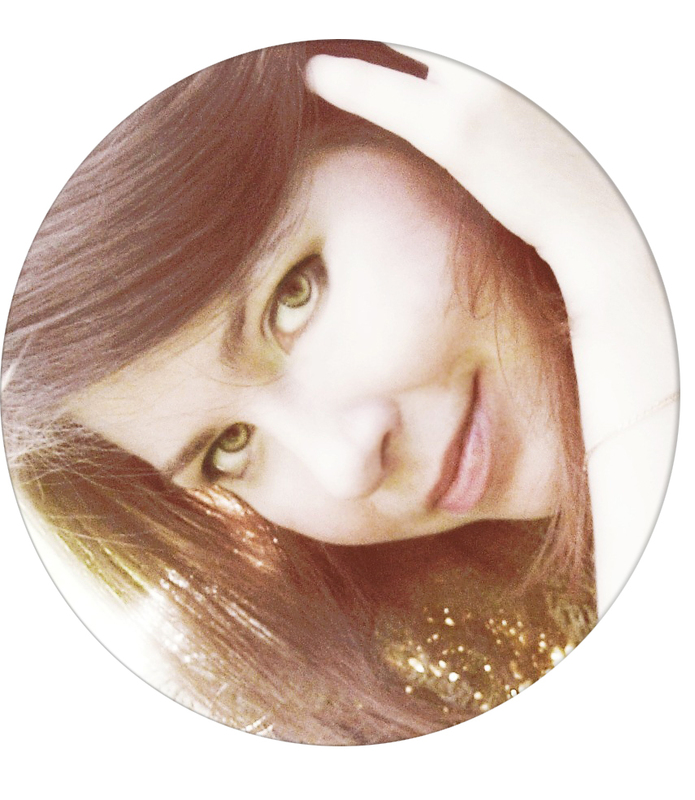 You should have come from Virginia Lu, but if not please start at the Altenew blog. I have a lot of cards to share with you today! My first card very soft and airy. 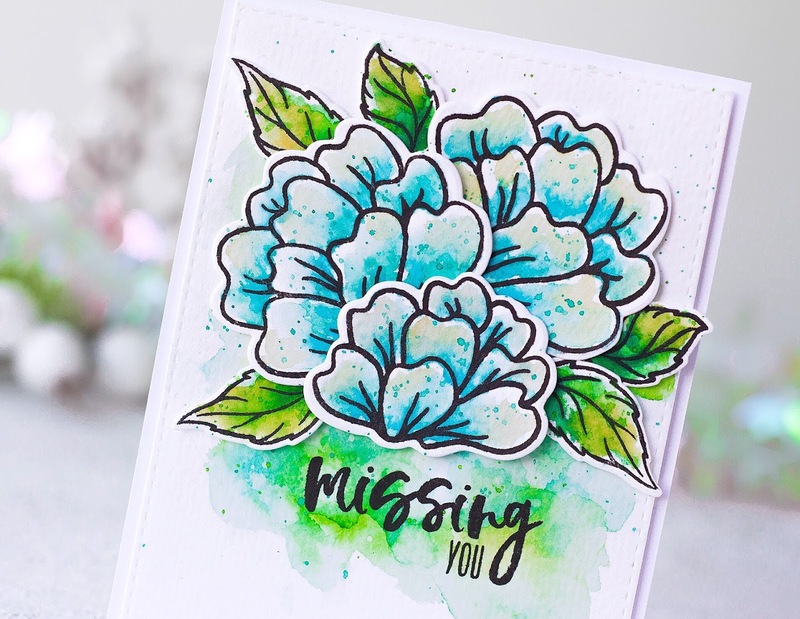 I decided to make a no-line coloring with this gorgeous flowers from Always There stamp set. 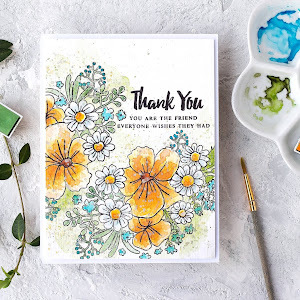 I stamped the flowers and the leaves onto watercolor paper with Antique Linen distress inks and softly watercolored the images using Altenew Watercolor Brush Markers. Then I stamped the brunch with berries from Blooming Branches stamp set onto watercolor paper using Altenew inks and slightly blurred ink with a wet brush, to make it more watercolored look. Once my coloring was done, I die cut the images with coordinating dies. I watercolored the background with some orange paint and foam mounted the flowers on top of my panel once my background was dry. For my second card I used Cozy Flannel cover die and Peacful Wreath stamp set. I've started by stamping this beautiful wreath using Altenew inks. Then, I blended light blue distress inks on my background and splattered it with the same ìnks and silver paint. Then I covered up my background with Cozy Flannel panel and foam mounted the wreath on top of this. Next, I die cut the word Peace out of silver glitter cardstock and adhered on top of the wreath. To finished my card I add the glossy accent on top of the berries. A detailed process of this card you can watch here on this post or in HD at my YouTube channel. For my third card, I used gorgeous Always There stamp set again. 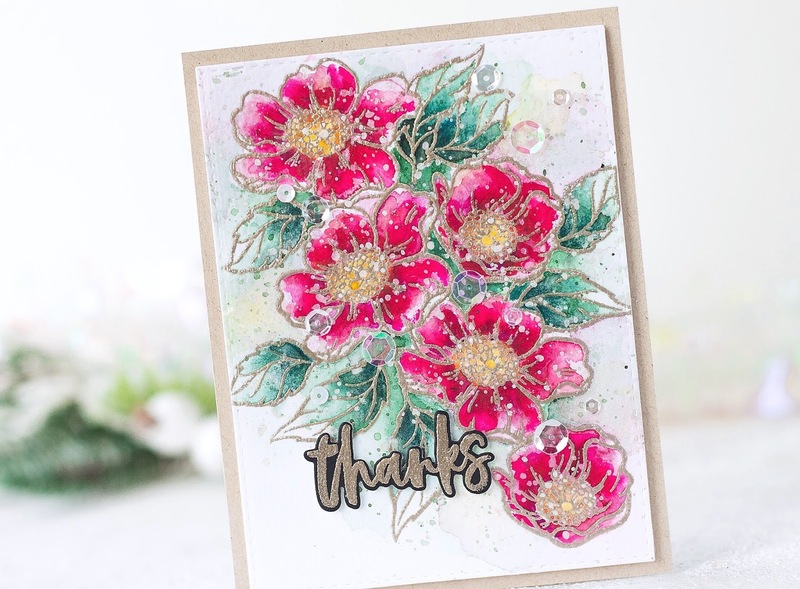 I stamped the flowers with clear embossing ink on watercolor paper and heat embossed it with metallic embossing powder. Next, I watercolored the images using Altenew Watercolor Brush Markers and splattered it with some of the leftover paint and also with a silver paint. 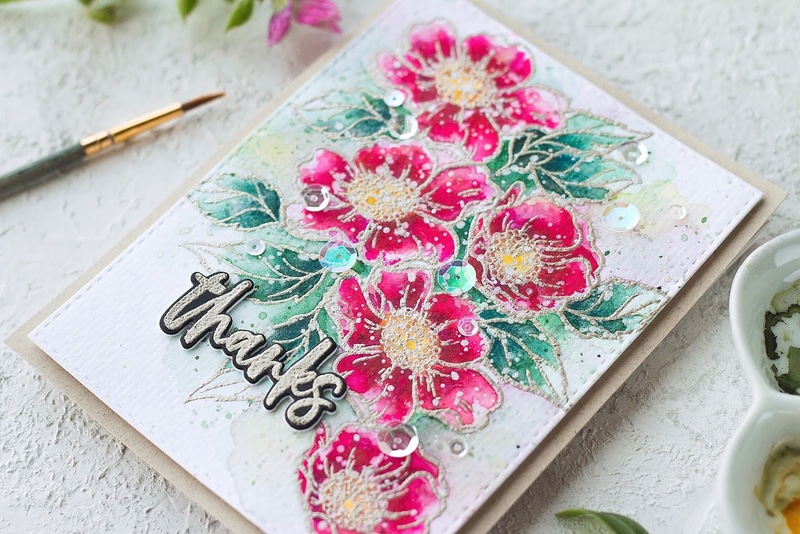 Then, I gold heat embossed the word Thanks from Playful Blooms stamp set onto piece of black cardstock and die cut it with coordinating die and adhered onto my card. 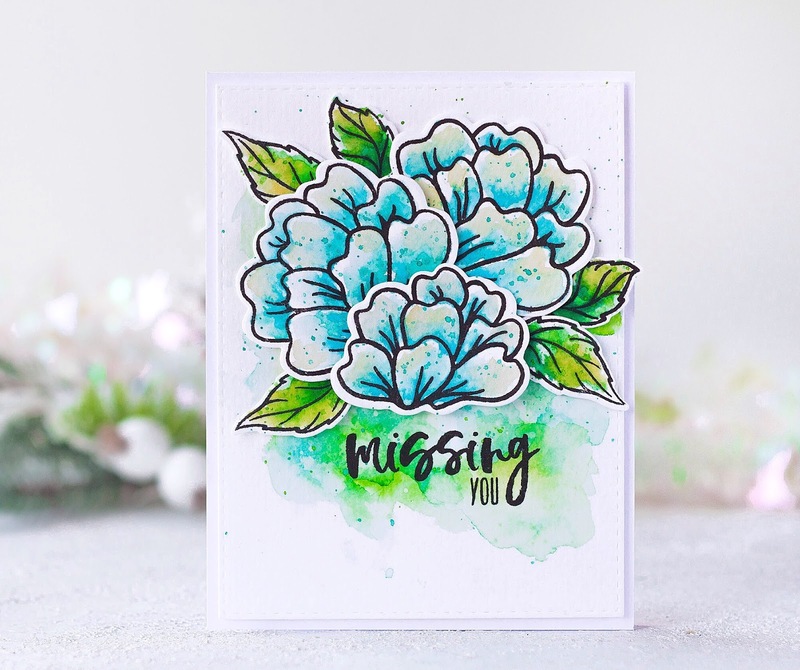 For this card I stamped the pretty flowers from Playful Blooms stamp set and the leaves from Always There stamp set with black ink onto watercolor paper and watercolored with distress inks. Then, I watercolored the backgrounds with distress inks and splattered with clean water. Once my background was done, I die cut the flowers with coordinating dies and adhered with foam tape on top of my panel. My last card is very simple. First, I watercolored the background with distress inks. 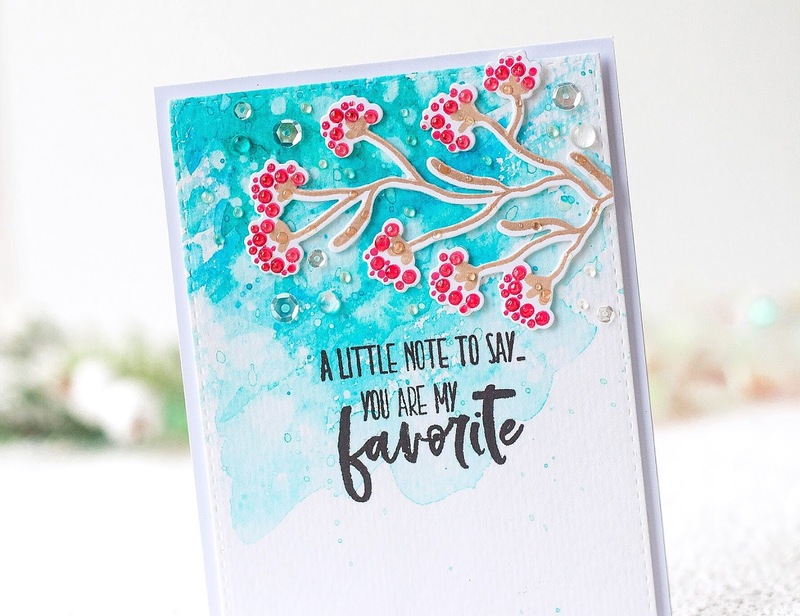 Then I stamped beautiful branch from Blooming Branches stamp set onto white cardstock using Altenew inks. Then, I die cut the brunch with coordinating die and foam mounted on top of my panel. To finished my card I added drops of glossy accent and sequins. To celebrate this release, Altenew is giving away a $50 gift certificate to SIX lucky winners! Please leave a comment on the Altenew Card Blog and Altenew Scrapbook Blog by 10/17/2018 for a chance to win. Six winners will be announced on the Altenew blogs on 10/20/2018. I will also randomly choose a winner from the comments left on this post and the prize will be $30 gift certificate to Altenew online store. One lucky winner will be announced on 10/17/2018 on this post. Hope you liked my cards! Don't forget to leave a comment for a prizes and a giveaway. Thank you so much for stopping by! Your next stop is Sveta Fotinia! The winner of $20 Gift Certificate is ROBIW! Congratulations! 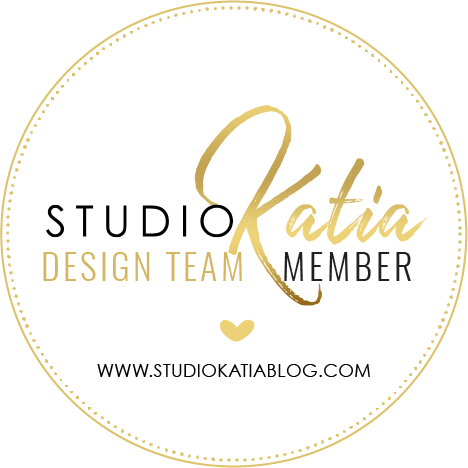 Please write at winner@altenew.com by 10/30/2018 with the subject line Altenew October 2018 Stamp/Die Release Blog Hop Winner from Kristina's blog. As always your designs are stunning! These are all so pretty! I love the sparkle and sheen on those pink flowers! It looks beautiful! Each one is so stunning! Your cards are all so pretty! Thank you for sharing! Such amazing designs, love your cards! Each and every card is so beautiful. Love the soft colors, wish I could get shading like you've done. Christmas wreath gorgeous. Each stunning and unique! Love them all, wonderful inspiration! I love the "Always There" cards you made. They are beautiful. Altenew made it hard for me to choose which items I wanted and you have just made it even more difficult. Thank you for such a beautiful card and inspiring me with such talent. 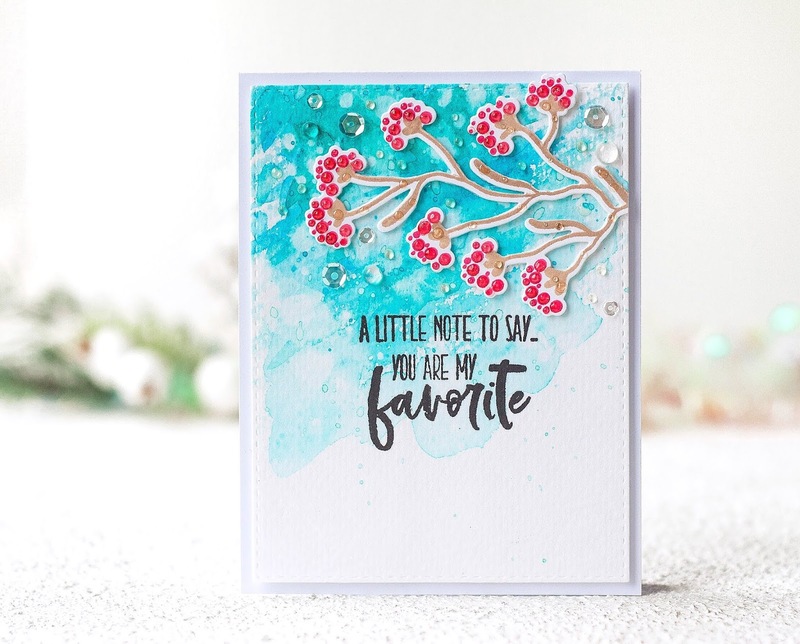 Stunning cards, I LOVE your water coloring on all these lovely cards! Beautiful cards. Your skill at water coloring is amazing! 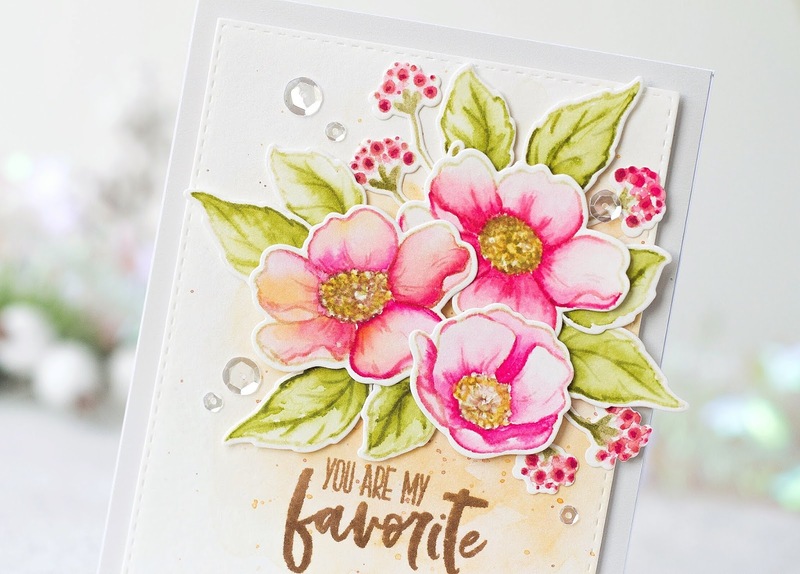 I think I am in love with the Playful Blooms stamp set. Beautiful inspiration! Love this release! 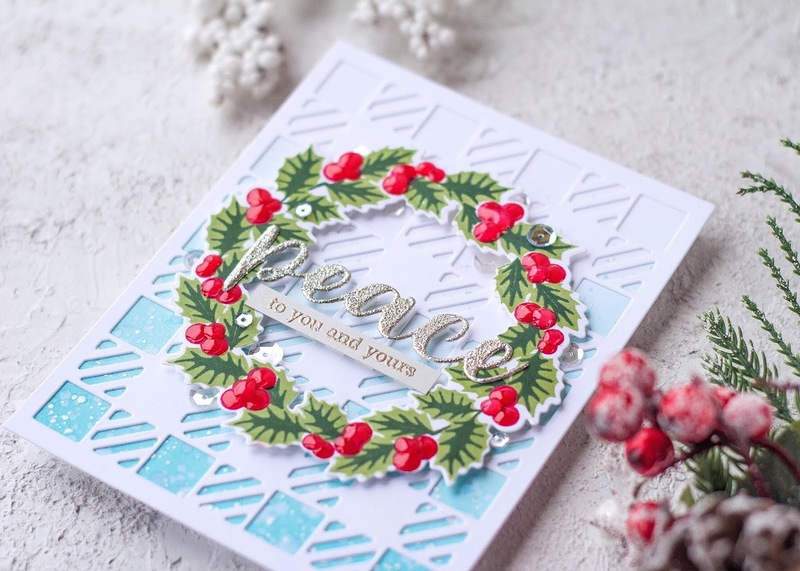 Love all your cards, especially the wreath card shown in the video. . I really like that background and how you used it. Great work! What stunning cards. Thanks for sharing. Such a beautiful set of cards! I absolutely love your first card using the Always There set. I love the soft colors and your watercoloring is stunning!! Your cards are so beautiful. I am in awe of your coloring abilities. Your flowers and wreath are absolutely beautiful. 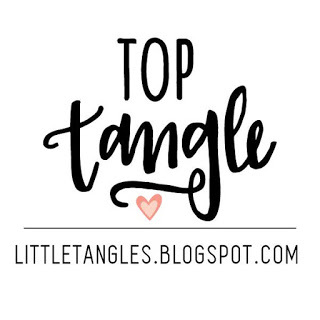 So many wonderful new products! You did a fabulous job showcasing some of them Kristina! Your designs are so pretty! Thanks for the inspiration! Wow! These are absolutely gorgeous. Thanks for sharing. The cards are so creative and beautiful!Love the flannel embossing with the wreath and flowers with the pop of silver! So many fabulous images on your cards, you've made them look so pretty & individual,loving how you added colour to the wreath card. The first card of flowers really appeals to me - gorgeous! Five beautiful cards. Wow! That's amazing! Wow, what an amazing collection of cards! Stunning, creative and beautiful. Fabulous variety and inspiration. What gorgeous projects!! 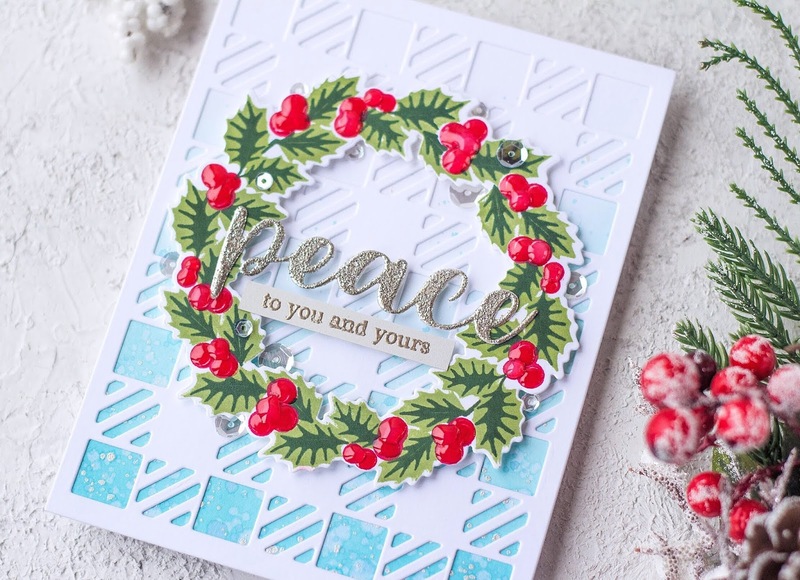 I love the florals, the bold wreath and the layering of your cards!! Beautiful cards. Your watercoloring skills are fantastic. The first one is my favorite, such beautiful colors and blending! 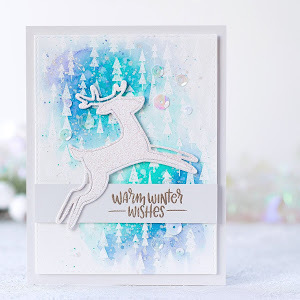 Stunning card designs! 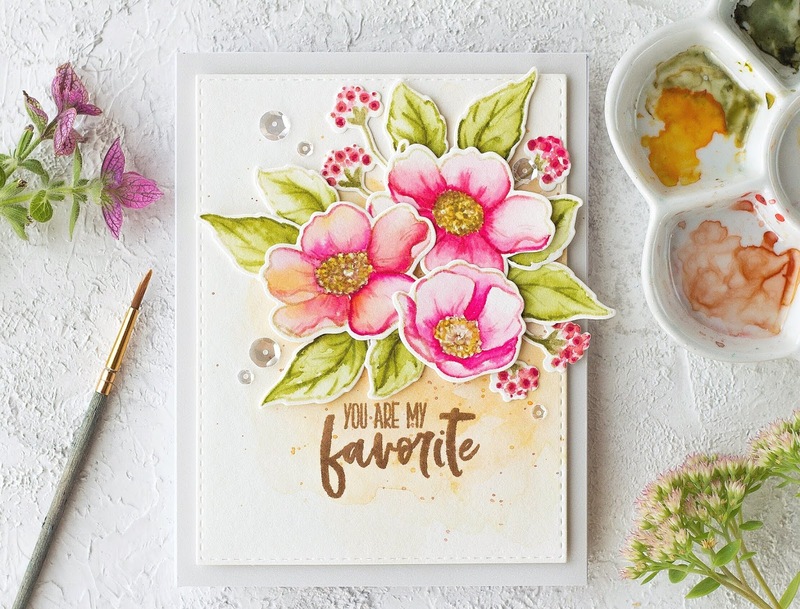 The floral cards are amazing and your watercoloring is so beautiful. 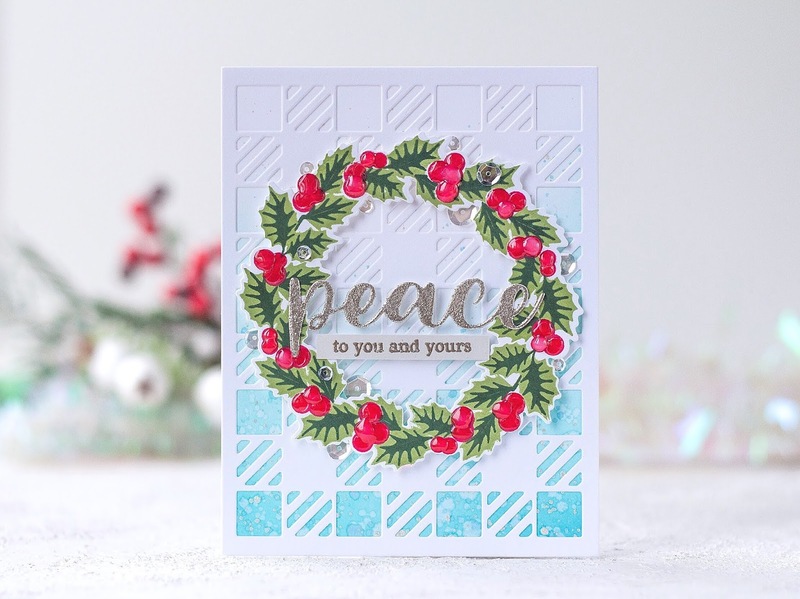 My favorite card, though, is the wreath on the flannel die cut. The blue background really makes the wreath pop! Your 1st two cards are especially DELIGHTFUL, I can't choose between them! Beautiful cards! I love your watercolors, especially the soft look of the first one. Thanks for the inspiration. You create some stunning works of art. They are all so pretty! pretty cover plate as a BG and the blue with the wreath. Altenew's new release is so beautiiful! I love the way you showcased so many of them. Your watercolors are just amazing. I love the colors and textures you show.. I love every single one of your cards, but the Peace wreath is my favorite. It's a great combination of colors (at least to me!). 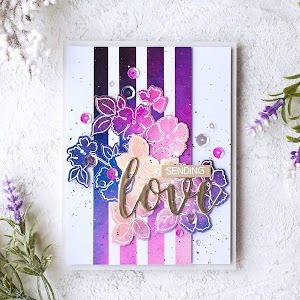 Such a beautiful post full of gorgeous cards!! Love the first one the best, but they are all so pretty! Beautiful cards, especially those with the Always There flowers. Wow! What lovely cards. I must say I liked the third one, those flowers really make a lovely impact. Thanks for sharing. Outstanding group of cards! wow!! You are the master of coloring for sure!! Loving the blue background also! 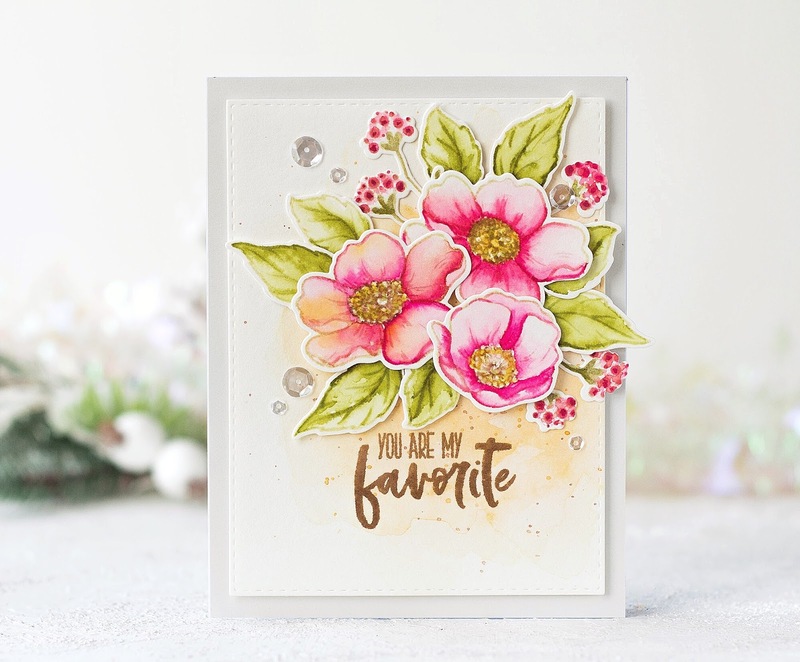 Your floral designed cards are so beautiful! Thanks for sharing and making a video! Your cards are always so beautiful! Thanks for sharing! Wonderful cards and so creative! Loving this Altenew release! 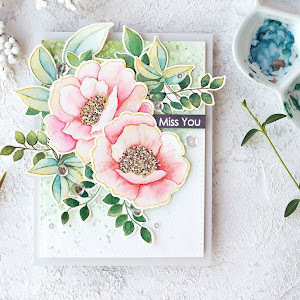 Your floral cards are so lovely! The Blooming Branches are my favorite because they are so delicate & I think they can mix easily with a lot of different flower sets. All of your cards are so beautiful! Oh my what beautiful cards! There’s so many great products from their release! Wow! Your Always There card is STUNNING! The texture and color is gorgeous and really caught my eye. Your cards have such a gorgeous, ethereal feel. Thank you for participating in the Altenew blog hop! Such beautiful cards! Great release. 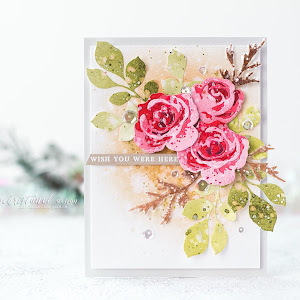 Beautiful cards, love the playful blooms and the always there stamp and die sets. I can't pick a favorite. I love them all. Thank you for sharing your talent with us! Your flower cards are amazing! Beautifully colored and such gorgeous designs. I am loving the wreaths I've seen. I think those are my favorite! Great cards. I especially like the wreath! Wow!! Absolutely Gorgeous cards! Your coloring is so amazing. Thanks for the inspiration. I love the softness in each of your cards. You do beautiful work. This Altenew release has some especially pretty florals to work with. TFS! Such gorgeous cards! I love the no line watercolor look on the first card so much---I must try this! And the wreath card is awesome! Can't wait to get this stamp/die set in my mailbox! Your video made its creation so easy to understand! Thank you. Beautiful flowers and I like the wreath. Love your cards...if I had to choose...the first one is my favorite! Your cards are so pretty! The water coloring you do is beautiful! TFS! I love your bright and pretty cards. Thanks for sharing. Your cards are so fantastic! I always look forward to your no-line coloring, but then you just keep impressing with all your other designs too. I particularly like the wreath card, because of the background. It looks like you're looking through the world's fanciest window at a snowstorm. Thanks for sharing all your talents with us! What a lovely and varied release with something for every occasion. 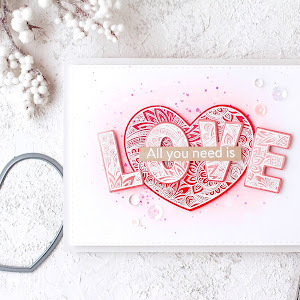 Especially love those layered bloom dies, the swiss dots background and that gorgeous alphabet. Thanks for the beautiful inspiration! These are all stunning cards! Oh my gosh, I have to read your blog again and study every card for all the gorgeous details! Your work is awesome! Thanks for sharing your beautiful cards! 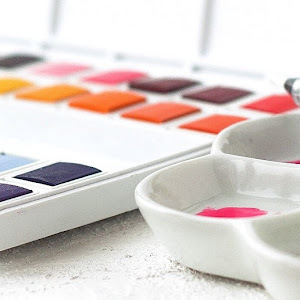 Love your watercoloring! So many beautiful cards. Your tutorial was great to watch and so helpful! Thanks for sharing. A gorgeous set of cards! That first one is my very favorite, the watercoloring is just stunning and I love the arrangement! I really like the wreath card. The pink flowers on the first card are magnificently beautiful!!! And the wreath card is fantastic!!! Every little detail in both cards is perfectly wonderful. (Of course the other cards are nice, too, but these are my favorites!) Thanks so much for sharing them. Your coloring is so vivid and beautifully done!! Loved ALL the card inspiration today!!! 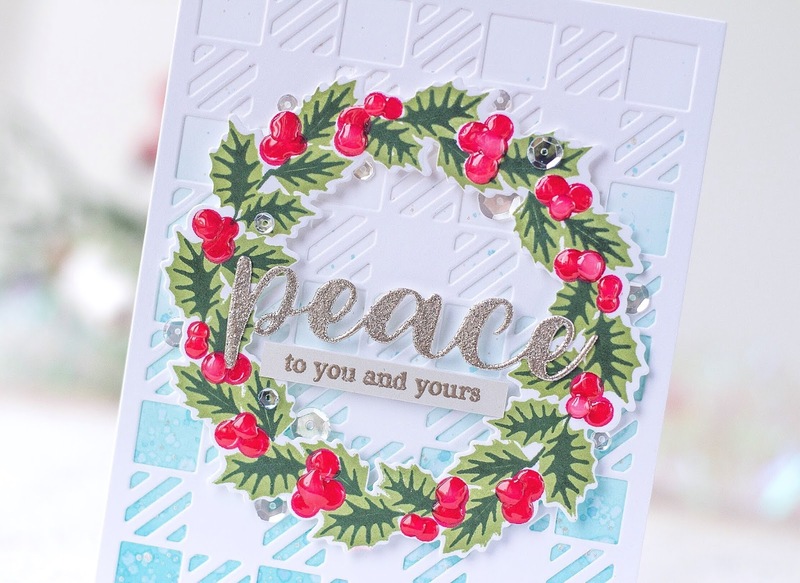 Love the Peaceful Wreath matched up with the fab Cozy Flannel die. But your brilliant DI blended blue background with splatters of silver made it even more stunning!! Love your work!! Gorgeous cards. 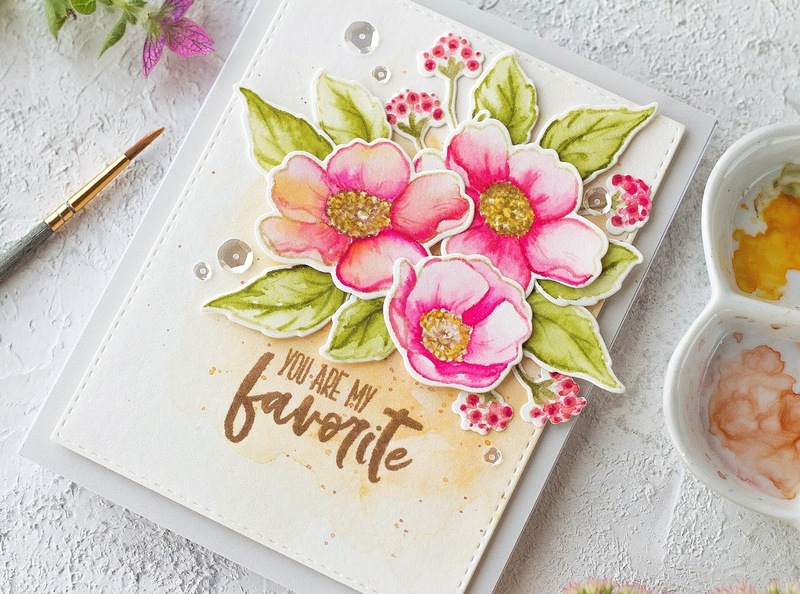 I already order the playful blooms stamp set and die but haven't received yet. 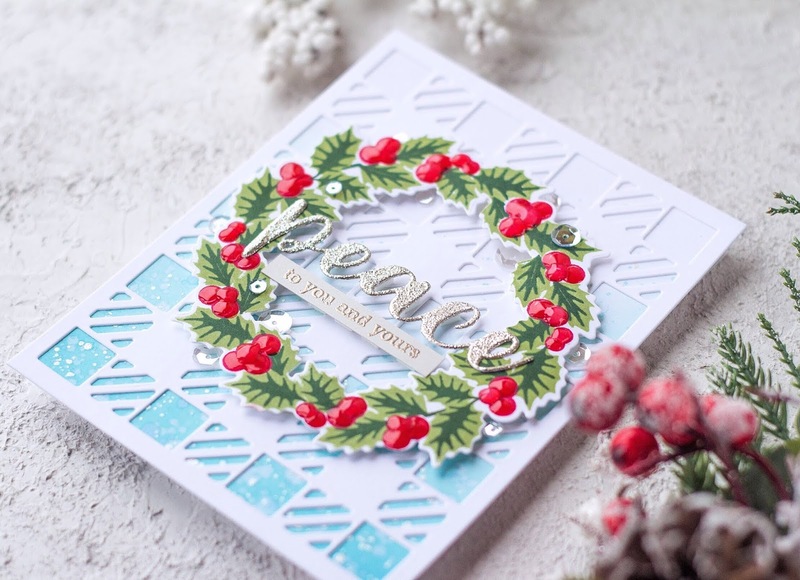 The wreath die and stamp set will be the next on my list to order. Thanks for using two of my favorites from this release. Thanks for sharing your time and talent with us. Delightful and lovely projects!! I adore that very first one!!! Stunning cards. I really love the first one!! The second card you share really makes me want that set and the cover plate is so fun when painted on half!!! Five awesome cards. 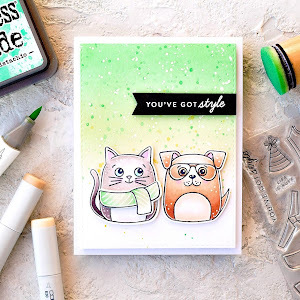 You make the no line coloring look easy because your card is soft and beautiful! I must give that a try. I love how you did your background on the wreath card. It really gives it a lot of dimension! The other 3 cards are gorgeous too! Floral cards are my favorite, absolutely wonderful. And your coloring is exceptional! You always do such gorgeous floral cards. Your third card with Thanks on it is spectacular!! I think that is my favorite card that I have seen on any blog so far tonight!! You certainly have a wonderful talent!! Wonderful cards! 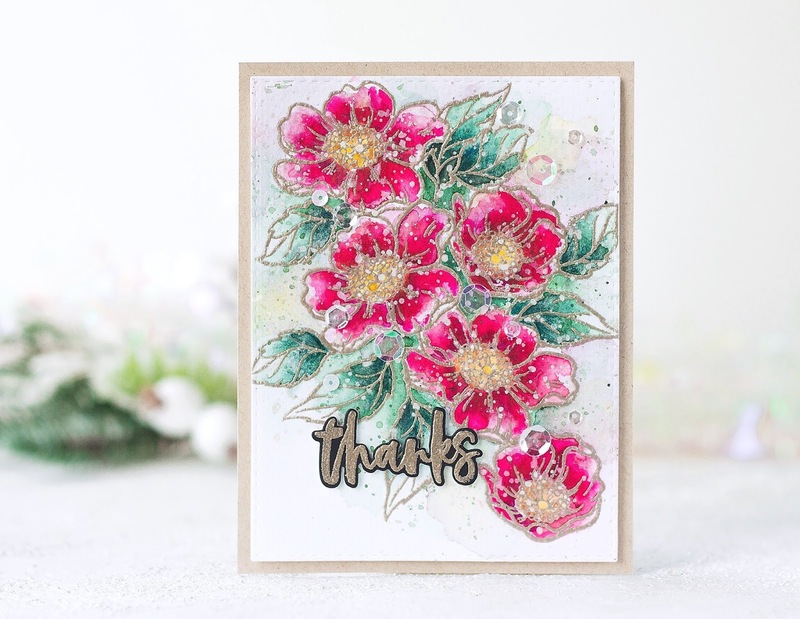 I love the way you colours the flowers from the Always There stamps set - beautiful! Great cards! Love your colors and the way you colored them. thanks for sharing. Stunning cards, the pink one you made is my favorite. By the way you take amazing pictures of your cards. I like how you add the water color off to the side. Such beautiful creations - you add so many wonderful little details. Like the glossy accents to the berries. Or the splatters on the flower petals. Such a joy to look at your photos. room. Love the wreath with the berries. Wow, stunning cards!! 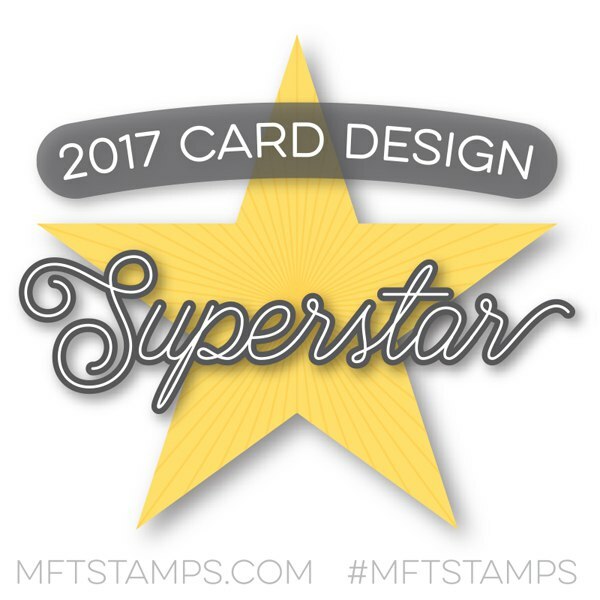 I love how you used stamps from different sets to create your images. Simply gorgeous! Beautiful cards! Love the coloring. The new release is really awesome! And I absolutely love the inspiration cards! They are just gorgeous! Hi Kristina! Your cards are stunning! They are so unique and special! Thanks for sharing them with us! You have been so busy! 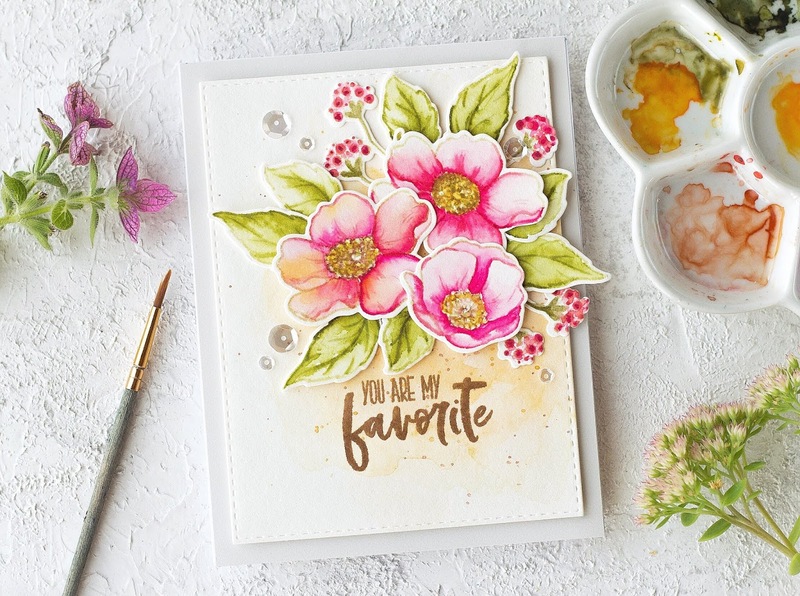 These designs are gorgeous :) I especially love the first watercolor card you created. Beautiful cards, I especially love your Always There pin flowers! Oh so many beautiful cards...lovely work. Thank you so much.....such a talented artist. These are all beautiful cards! That first one with the long line coloring is breath taking and I love the background of the last card. Beautiful cards! I really love the card with the wreath! I'm enjoying all the inspiration along the hop! Beautiful cards. Your coloring is amazing. Can't find your winner announcement?